Waking up very early is a pain. I’m a landscape photographer and that is really hard. Of course, it depends on your preparation the night before the shoot. If you prepared early, planned early and slept early, you will have an easy way of waking up very early in the morning. Of course, it also depends on how far you are from the photoshoot. This happened to me last Saturday (10 January 2015). I woke up on time. But since my eyes are failing me, I slept a bit. But when I woke up, it’s already too late. I woke up close to first light. Even though my gears are all packed and rushed out quickly, it’s already too late. It’s so bad, I saw the RED sunrise as I was driving towards the location. Everything was over when I arrived. So instead of picking up my camera bag, I picked up my drone bag. I have a DJI Phantom 2 (with Gimbal) attached is a GoPro Hero 4. I got teased with all my fellow photographers because I arrived at nothing. They’re right. I should have gotten earlier to shoot. But it’s all over anyway. I opened my bag and setup my drone. I attached the monitor to my controller, put the propellers on the drone and placed it on a levelled rock. I also did some pre-flight checks. Once everything is ok, I few my Phantom! This is officially my first time flying the Phantom to create a short video. I already flew this Phantom several times on an open field for testing and practicing. I did practiced a lot so I can orient myself on the controls. But this is different. I’m really flying it for the sole purpose of creating a video clip! It is satisfying. 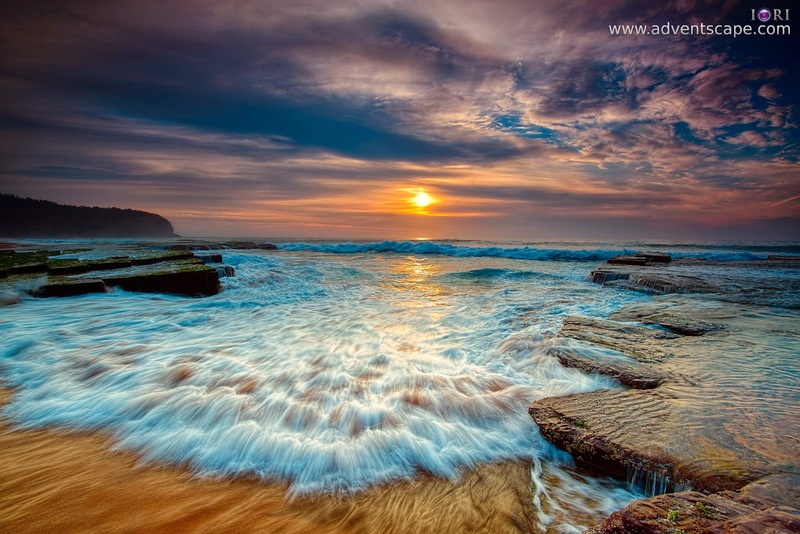 Turimetta Beach is highly popular to landscape photographers around Sydney. It’s an amazing place to take seascpe photos. You can compose and use several techniques to achieve different moods on your photograph. This is one of my favorite places to shoot. But this time, I didn’t take a photo, I only took videos. I used up 2 batteries in this shoot. I’m quite satisfied as I managed to grab enough clips to create a video. We are 7 in this group. We’re all tired but satisfied (I’m not! I didn’t get any RED sunrise!!) Anyway, everyone agreed for a breakfast near the beach. We went to this place called Ocean’s Narrabeen Cafe. It’s a good place with a view of the sea! Amazing ambiance as well! I love the food as it’s delicious with generous serving. When I arrived home, I immediately download all videos. I used a software called GoPro Studios. It’s a nifty sofrware that does so much. It’s a free software, no vendor watermarks, does simple timeline, does have a few presets, does have some editing feature and it just works. The best thing about this sofware is that it’s not memory intensive software! My 5 year old PC had finished editing my video clip! If I used Adobe Premier or Pinnacle, I would surely not finish it as I will keep on lagging and hanging. Video is just ½ of the movie – I need sound. I’m a gamer previously. So I love those opening cinematics from video games. I think they’re made from CGI. Have you watched the opening cinema of Final Fantasy, Devil May Cry or Diablo? Yes the video is amazing, but so as the audio! I searched Youtube for a suitable audio for this video and found one. I love how this is composed and I managed to tailor the scenes properly. The music is from Twisted Jukebox, Angels Will Rise. I don't recommend sleeping again after having waken up by the alarm. You just need to sit up, stand and be on your way. If not, you might oversleep and miss the opportunity of sunrise. In the event that you miss it, maximise your presence. Just shoot, shoot some more and do more composition. Make the most out of the situation and don't be discourage. Vow to not be defeated sleepiness again!